Definition: noun; an abstract but perceptible thing that issues or originates from a source. My work in this exhibition focuses on the analysis of volumetric forms within the human figure. Essentially, I want my findings to reinterpret the human figure through the various lenses of form. This transformation reveals the interaction of forms between and within my selected human figures, and hopefully poses new visual implications for the viewer. I chose sixteen-gauge copper wire, as my initial medium, which was gesturally sculpted as contour line into the remarkably unique characteristics of what I perceive as human. These descriptive gestures were then run through an etching press against dampened 270 gram weight Arches Cover White paper. The thickness and rigidity of the wire moulded itself into the receptive cotton paper creating a blind embossing. This embossing then assumes an intaglio situation with the positive image lying into, and below, the planographic surface of the paper, which then also yielded a relief surface opposite the embossed line. In the reality of this transformation, the paper takes on the quality of “objectness,” and its surface evinces compelling lights and darks whose shadowy effects seem to dance from the primal, human channels left behind. The experience of the work reflects the transformative element discussed in the idea and creation of the works. From afar, the gallery appears as if the walls are lined with large sheets of unworked white paper. 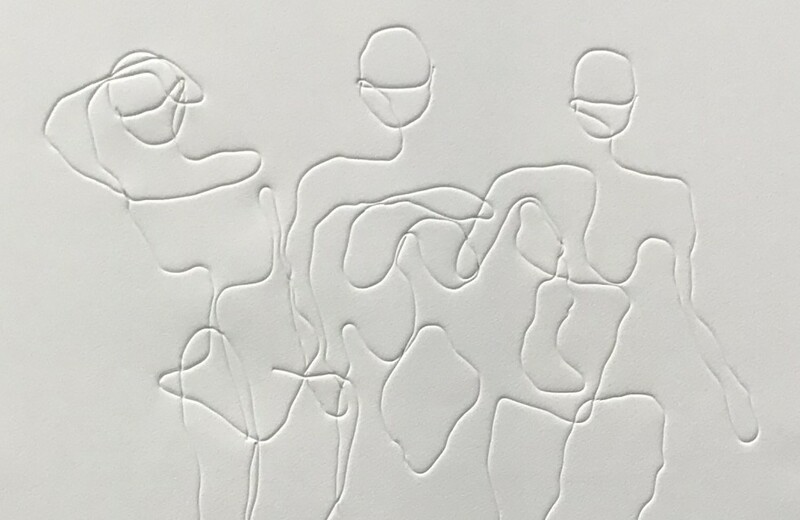 In approaching the work, the beginning details of the embossed humans, figures, and forms emerge. Finally, upon close and careful observation, the delicate light, shadows, and paper quality are illuminated. This transformation is seen in terms of idea: from human to figure to form, the process: from idea to wire to embossing, and in experience: from unmarked paper to observed forms to light and shadows within the work. In all circumstances the end product is the result of its origin; it is an emanation of the human in terms of idea, process, and experience. Rebecca Boolba is a senior studio art major, cultural heritage and preservation studies minor from South Mills, NC. With an interest in gallery and educational work, she has obtained internships at START Gallery and through a collaborative research grant to create the public exhibition, Open Spaces, and has served as a teaching studio assistant in the Wake Forest Art Department. She has appeared in the exhibitions Rattling Cage and A Narrative Toward the Light. After graduating Wake Forest in May of 2018, she will move to Norfolk, VA to seek work as a full time teacher.